The "S" in President Obama's DHS doesn't stand for "security." It stands for "sleaze." In the wake of Dirty Harry Reid's sabotage of the filibuster, Democrats have rammed through the Senate nomination of a shady Chicago crony associated with dangerous Clinton corruption and at least two visas-for-sale schemes. On Tuesday, Democrats on the Senate Homeland Security and Governmental Affairs Committee advanced Mayorkas' nomination to the Senate floor by a 9-0 vote. All Republicans voted "present" in protest. Thanks to Reid's nuclear option on the filibuster, Obama's party water-carriers in the Senate only need a simple majority. The appointment (scheduled for a Wednesday vote) is all but assured. What qualifies Mayorkas to serve as DHS deputy secretary? Well, there's his prodigious fundraising in 2008 as an Obama bundler, of course. There's his dutiful pro-open borders record in his current job as director of the U.S. Citizenship and Immigration Services. And once again, the operational motto of the Beltway prevails: Screw up, foul up, move up. During the Clinton years, then U.S. Attorney Mayorkas phoned the White House on behalf of convicted drug dealer Carlos Vignali. Mayorkas joined other high-profile California liberals in the dialing-for-pardons campaign. Vignali's father (also suspected of drug trafficking) had dumped $200,000 in the coffers of Hillary Clinton's brother, Hugh, to secure his son's commutation. 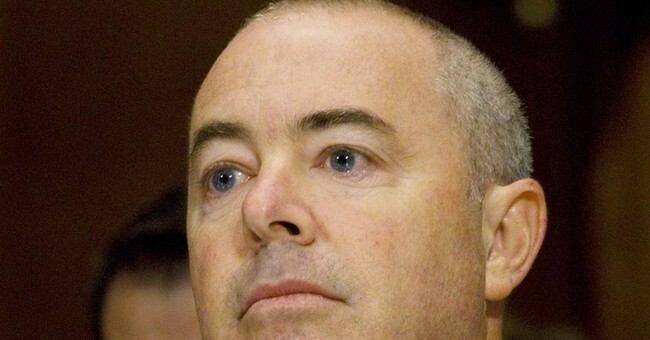 Mayorkas pleaded ignorance and admitted failure to do his "due diligence." Like fellow Clinton corruptocrat and current Attorney General Eric Holder, Mayorkas' pardongate "mistake" cost him nothing. He was instead rewarded with plum government positions and access. Mayorkas and other higher-ups are being investigated for their alleged roles in intervening on behalf of GreenTech, a crony company with ties to Democratic Virginia Gov. Terry McAuliffe and Hillary Clinton's other brother, Anthony. The scheme reportedly gave "special treatment" (in the words of one USCIS official) to the company, which wanted EB-5 visas for deep-pocketed Chinese investors. In addition, The Washington Times reported this week that both Harry Reid and GOP Nev. Sen. Dean Heller lobbied the Obama administration to reverse itself on EB-5 decisions for foreign investors in a Las Vegas casino hotel. None of this EB-5 corruption should surprise longtime readers of my column. As I first reported more than a decade ago, the EB-5 immigrant investor program was created under an obscure section of the 1990 Immigration Act. The law allows 10,000 wealthy foreigners a year to purchase green cards by investing between $500,000 and $1 million in new commercial enterprises or troubled businesses. After two years, foreign investors, their spouses and their children all receive permanent resident status -- which allows them to contribute to U.S. political campaigns and provides a speedy gateway to citizenship. The benefits of the EB-5 economic development plan have gone to former federal immigration officials who formed lucrative limited partnerships to cash in on their access and to shady foreign fraudsters. The supposed economic benefits of the program are unverifiable and inflated hype. Whistleblowers have been punished and ostracized. Independent media have been intimidated and, in the case of the Franklin Center, sued for raising questions about the Democrats and immigrant investor fraud. The most transparent and ethical administration ever is stonewalling to protect Mayorkas. And citizenship is available to the highest crony foreign bidders. Perhaps when White House journalists finish protesting Obama control freaks limiting their access to photos, they'll take an interest in top homeland security officials recklessly selling access to our shores. There's much, much more to the stench and the story.